There’s a common number thrown around for how many scents a human can smell – 10,000. Even scientific literature has cited this figure, though it is highly debatable. This makes a lot of people believe that they have an extremely poor sense of smell compared to most animals, like familiar canines. In reality, it seems humans may be able to smell more than one trillion different odors, debunking the myth that we humans have a nose only for a fraction of the molecules out there. There’s a reason we can smell. It’s a fundamental sense that helps us distinguish between what foods are right to eat or not, sense danger and even find mates. There’s a sort of inferiority complex regarding our sense of smell. Ask most people on the street how they think their sense of smell is compared to animals, and they’ll tell you that we can smell oh so little. That may not be true, according to researchers at Rockefeller University in New York. The typical nose has 400 or so olfactory receptors, but that doesn’t mean they only bind to 400 molecules. Rather, these receptors work together to sense various mixes of molecules. For instance, the eye has only three eye receptors (the cones), yet people can see up to 10 million colours. It’s hard to distinguish a colour from another very similar one, but even though the nuances may by very subtle, your brain can still pick them up. For the experiment, mixtures of 128 different scent molecules were created. Individually, the molecules resembled odors such as grass or citrus, but when they were all combined, the mix smelled unfamiliar. The team led by Leslie Vosshall, an olfaction researcher at the Rockefeller University in New York, asked volunteers to smell three vials containing three scents (two of one scent along with a third, different scent) and identify which of the three was unique. This process was repeated for more than 260 sets of vials. Based on how often the volunteers were able to identify the correct unique smell, an extrapolation was made to estimate how many scents an average person could distinguish out of all possible mixtures of 128 molecules. 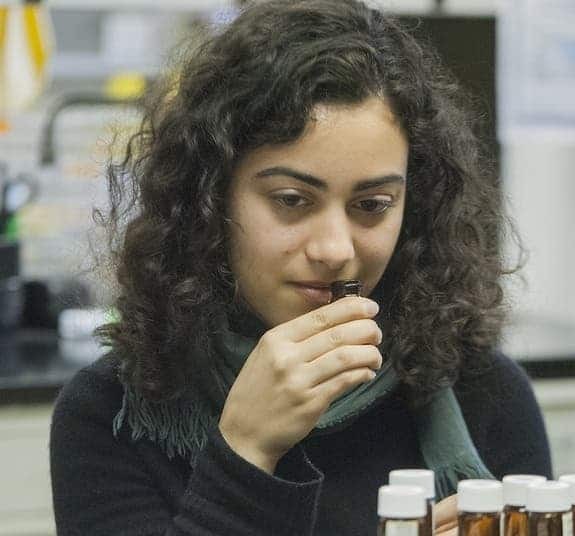 Their calculations suggests that an average person can distinguish from up to 1 trillion scents, but this figure could be much higher because there are more than 128 odor molecules. Of course each person smells more or less better. The keenest sense of smell, based on previous research, is that of a non-smoking caucasion woman, in general.